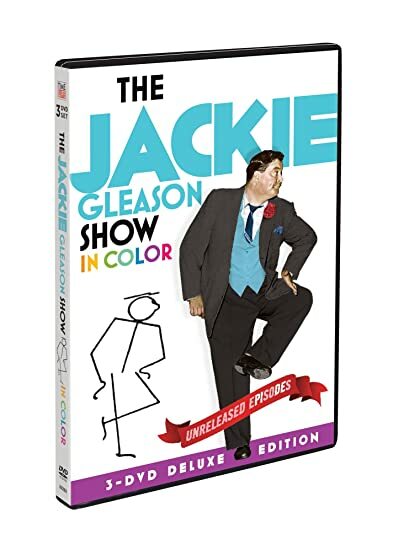 The Jackie Gleason Show: In Color (Deluxe Edition) - BUY THIS ON DVD! From 1966 to 1970, THE JACKIE GLEASON SHOW was taped In Color in beautiful Miami Beach, Florida. Jackie entertained the best audience in the world with his classic characters, celebrity guest stars, and hilarious sketches, including scenes from the beloved Honeymooners. His smash-hit show brought us an hour of non-stop entertainment every week, and now fans can get their Jackie “fix” anytime! 3-DVD Set: Twelve never-before-released episodes of The Jackie Gleason Show. All episodes beautifully re-mastered and in full color! Unseen for almost 50 years! Seven Honeymooners sketches that haven’t been seen since they originally aired. Guest stars: Jack Benny, George Burns, Milton Berle, Tony Bennett, Mickey Rooney, George Gobel, Groucho Marx, Phil Silvers, Florence Henderson, Frankie Avalon and more! You may have other Jackie Gleason collections, but you don’t have these episodes! Jackie Gleason, “The Great One,” was a pioneer of television comedy. "The Honeymooners" and "The Jackie Gleason Show" have been audience favorites for more than half a century. CC: All discs contain the closed captioning option. Over 8 hours of classic TV entertainment. THEN SEND IN YOUR NAME, ADDRESS AND FIVE COMMENTS TO contests@efilmcritic.com orWeLoveHBS@aol.com. (Just one e-mail please.) Put "NOW WE CAN WATCH JACKIE GLEASON WHILE WE EAT" in the subject line and cross your fingers. We will draw names and one of the prizes from PBS will be yours. Only 1 entry per household.